Farm Gate Hardware - Double Strap Hinges & Single Strap Hinges. Double Strap Hinges are the best hinge design for Field Gates, Farm Gates, Rail Gates and Entrance Gates. The design of double strap hinges provides easy adjustment with heavy construction to handle gates upto 10ft wide. Double Strap Hinges are available either individually or as complete sets in 4 component combinations. Double Strap Hinges are also available Individually for applications that don't fit the set components. 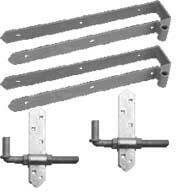 See Hinge Mounts, Gate Eyes, Gate Hangers and Pins for a full range of different methods of hanging your gates. Single Strap Hinges both straight & cranked are available in pairs at lengths of 18", 24" & 36"
Pricing is for a Set (Click More Details for Set contents), Pair (PR) of Hinges or Each (EA) as under Unit. Carriage Bolts for the 8256 Adjustable Hinge Mount are NOT included due to differing post thicknesses. 6 1/2" (good for 6" posts) are available Here. Double Strap Hinges are also available Individually for applications that don't fit the set components. See Gate Hangers for a full range of different methods of hanging your gates. Single Strap Hinges are available in pairs at lengths of 18", 24" & 36"Single Strap Hinges are available in pairs at lengths of 18", 24" & 36". Available in strap lengths of 5" & 24"
Available in 12, 18 & 24" strap lengths. Finishes : click for more information. Unless stated otherwise, all products come with screws but carriage bolts may not be provided. Single Strap Hinges are available in pairs at lengths of 18", 24" & 36"
12" Heavy Duty Straps with Pin (1/2" x 4"). HDG & BPPCG. Sold in Pairs, 2 straps & 2 pins, with screws (no carriage bolts included). NOTE: 8317 Pins are only available in HDG finish. BPPCG items will have HDG pins & BPPCG Hinge & Bottom fitting.